Sheet piling construction building sites, the product quality is the key determinant of the success of the project. As more and more construction projects will need to sheet piling retaining, sealing, then how effective way to distinguish the quality of the pros and cons become a topic of concern to everyone. Here Shunli steel industry would like to tell us about how to distinguish by weight The quality of sheet piling. 1、in order to prevent some non-performing businesses, for their own gain, and that poor quality products to impersonate quality sheet piling to make more profits. In the purchase process if you do not help yourself theoretical weight for each model, it is easy to get defective also totally unaware. 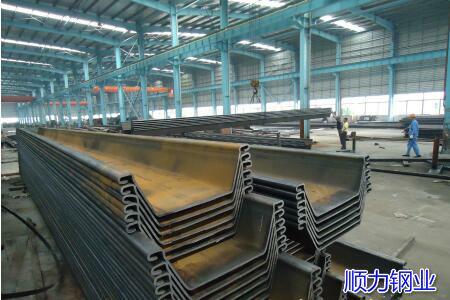 U, Z type, combined pile cap shaped sheet piling and so on. Familiar with these common sheet piling type and weight, for we have a great help in the purchase process. 2、in the case of the same area, they do not model the theoretical weight is not the same, that we could not see through this feature to determine whether the quality standard. Well, this topic will share here, you have any questions about it please contact us at the Union or mail. If you ask the question is rather special, or inconvenient to elaborate phone can be sent to the mailbox: will@shunlisteel.cn (Customer Care Assistant). Here we have professional engineers to answer it for you. Strict QA \ QC system to make sheet piling made along each of force have become customer satisfaction, quality.